Formed in 1989, from the ashes of the pop rock combo Terraplane, Thunder were discovered by erstwhile Duran Duran guitarist Andy Taylor, who produced not only their deal securing demos, but their first and second LPs. Indeed Taylor often said that Thunder was the band he should have been in. The band quickly established themselves as one of the most exciting live acts in the world, effortlessly making the transition from clubs to theatres to stadiums. With their fusion of music influenced by all the great 70s Classic British Rock bands and upbeat cockney rapport, audiences warmed to them everywhere they went. 1990 saw the release of their critically acclaimed debut album "Backstreet Symphony" on EMI ( in UK, Capitol & then Geffen in the US). This year also saw a cracking European tour with Heart as well as their now famous performance in the opening slot at the Donington Monsters Of Rock Festival (crowd 80,000). No one who witnessed it will ever forget it. "Backstreet Symphony" sold 250,000 copies in the US, due to "Dirty Love" achieving 6 weeks at number 1 on Dial MTV. A combination of the onset of grunge and record label inertia meant this was as far as it went. By 1992 Thunder were very popular indeed: their second LP ("Laughing On Judgement Day") entering the UK charts at n. 2 (pipped at the post by Kylie's "Greatest Hits"). Touring included South America with Iron Maiden and Europe with Extreme. In 1995 they opened for Bon Jovi on their European stadium tour and once again, predictably, stole the show. During the first 10 years they were together, Thunder notched up an incredible 18 top 40 singles in the UK. Not bad for a band that were hardly ever played on British radio. This was mostly down to the stoic loyalty of the Thunder fans who never failed to show up for tours. Proof positive (as if any were needed) of the consistently high quality of the band's live show. Having become disillusioned and frustrated, they split up for 2 years, only to be lured back for the special guest spot at 2002's UK Monsters Of Rock Tour, where the band's passion was well and truly re-ignited. The tour was a resounding success for them. 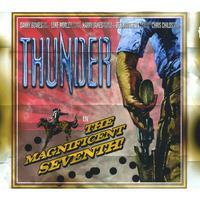 The Magnificent Seventh by Thunder comes with powerful riffs, soaring melodies and sheer classic rock stamped all over it. Take a listen! There's almost an HOUR's Worth of GREAT music.